Since 2010, the Foundation for Alcohol Research and Education (FARE) Annual Alcohol Poll has examined Australians’ attitudes towards alcohol, their consumption behaviours, awareness and experiences of alcohol harm, and perspectives on alcohol policies. Now in its ninth year and despite increased media focus on illegal drugs, the 2018 Poll continues to find Australians are concerned about alcohol. The majority of Australians indicate that Australia has a problem with alcohol (73%) and that alcohol-related problems will remain the same or get worse in the next five to ten years (71%). Perceptions of the alcohol industry continue to be poor, reflecting ongoing public scepticism of the actions and intentions of vested interests. More than half of Australians (55%) believe the alcohol industry targets young people under 18, and a majority (68%) believe industry should pay for reducing alcohol harm. New to this year’s Poll is that 61% of Australians believe the alcohol industry would downplay independent university research linking alcohol to a range of harm. So what does the Poll tell us about Australians’ drinking habits? Well, a majority of Australians drink alcohol (82%), with bottled wine (29%) and regular strength beer (22%) remaining the preferred choice of drink. Despite 71% of drinkers being comfortable with how much they drink, almost half (45%) or about 5.7 million Australians, report drinking alcohol to get drunk. For the first time, we asked Australians about their use of alcohol delivery services. The Poll found that 30% of Australian drinkers have used an alcohol delivery service, with 92% having used such services in the past 12 months. Better value for money (36%) and the convenience of delivery (34%) are cited as the main reasons for use of these services. As an emerging market, these findings are concerning given the limited and inconsistent regulation that currently applies in this area. The Poll continues to highlight alcohol’s far-reaching impact on the community. Indeed, 37% of Australians have been affected by alcohol-related violence, including 21% who have been direct victims. Women are more likely than men to have been affected (41% compared to 34%) and to be direct victims of alcohol related violence (23% compared to 18%). On the other hand, men are more likely than women to have been a direct victim of alcohol-related violence in the last 12 months (27% compared to 20%). In addition, one in four (23%) parents or guardians with children under 18 report that their child has been harmed or put at risk of harm because of someone else’s drinking. While Australians readily associate alcohol harm with violence in our pubs, clubs and on our streets, there is much less knowledge of alcohol’s long-term harm. Only one in four Australians (28%) are aware of the content of the National Health and Medical Research Council’s Australian Guidelines to Reduce Health Risks from Drinking Alcohol. Fewer than half of Australians perceive links between alcohol misuse and stroke (38%), mouth and throat cancer (26%) and breast cancer (16%). However, it is clear Australians want to know more about these harms, with an overwhelming majority (84%) reporting that they have the right to know about alcohol’s long-term harm and 80% believing governments’ have a responsibility to educate Australians on this matter. What this clearly demonstrates is that Australia urgently needs a nation-wide public education campaign to highlight the harms associated with drinking. This year’s Poll once again highlights strong support for a range of alcohol-related policies. 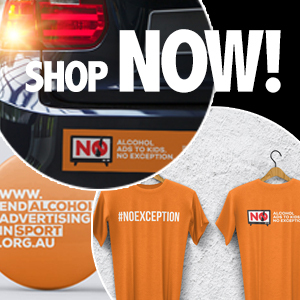 Two thirds (67%) of Australians support a ban on alcohol advertising on television before 8:30pm, just over half of Australians (52%) believe that alcohol sponsorship should not be allowed at sporting events and 51% support limiting the number of alcohol outlets to reduce alcohol-related family violence. Nine years on, the Poll continues to show that Australians are concerned about alcohol’s impact and want governments to do something about it. Some governments, notably the Northern Territory Government, have recently stepped up to this challenge, and others should be encouraged to follow suit. This year provides a rare opportunity for Australian governments across the country to take action to prevent and reduce alcohol harm, with finalisation of a new National Alcohol Strategy expected to occur mid-year. The Ministerial Drug and Alcohol Forum (MDAF), the body responsible for finalising the new strategy, must ensure that a new National Alcohol Strategy has clear priorities, commitments, timeframes and accountability mechanisms. Without these, change will not occur. More than half of Australians (57%) believe governments are not doing enough to address alcohol harm and three quarters (76%) believe more needs to be done to reduce the harm. It is time for the MDAF to acknowledge the findings of this year’s Poll and to exercise strong political leadership by finalising and implementing a new National Alcohol Strategy that will prevent and minimise alcohol harm. Time will tell whether governments listen to the sentiment expressed in this poll.